The Olympia Cycle & Ski website has moved. 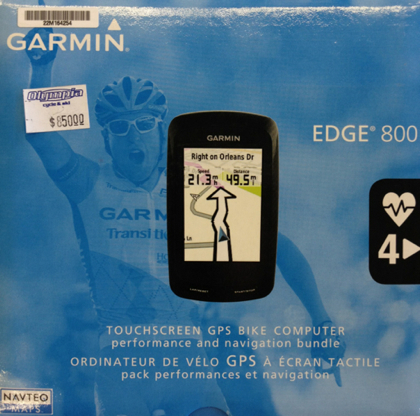 If you're a bit of a bike geek (just admit it - we know who you are) the Garmin Edge 800 bundle pack is going to make you very happy. It has a touchscreen GPS, heart rate monitor with chest strap, speed/cadence sensors and readout, street maps, location data, elevation and more. You can download and follow routes, analyze all of your stats, and much more. The whole package is $645 (yes, the price tag on the the pic above says $850, which is the MRSP, but we've price matched with some competitors and brought the price down) and we have a couple in stock now. Satisfy that inner geek in a socially acceptable way and take a look at one today.